*Please be aware that Google Maps incorrectly identifies the location of parking lots around STAPLES Center. This is being updated, but please refer to the graphic below for an accurate map of parking lots around STAPLES Center. The arena location is accessible from many freeways. 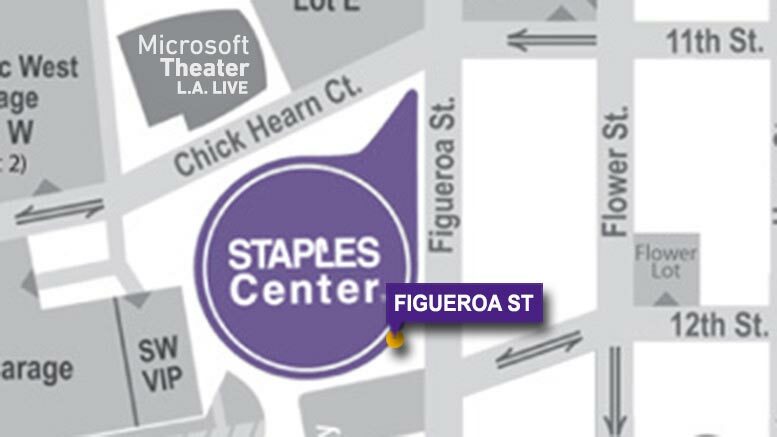 Please be advised when planning your route to STAPLES Center that Chick Hearn Ct. is frequently closed between Figueroa St. and Georgia St. (the street just west of Microsoft Theatre). Ridesharing: The JW Marriott Hotel is the designated ridesharing pick up location (Olympic Blvd side). 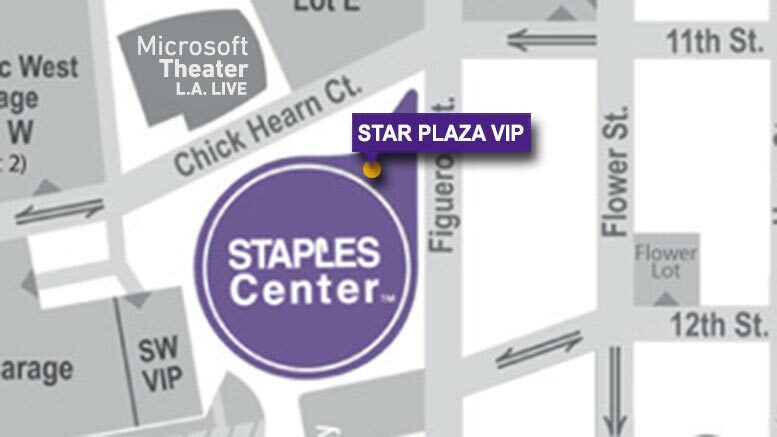 *These directions are to STAPLES Center itself, look below for directions to parking lots in the vicinity of STAPLES Center. from Carson, San Pedro, etc. from Santa Clarita, Burbank, Glendale, etc. from San Diego, Orange County, Anaheim, etc. from Santa Monica, Culver City, Westwood, etc. Turn right at Pico Blvd. At L.A. LIVE Way, turn left to 11th Street/Chick Hearn Ct.
from West Covina, San Bernadino, etc. from San Fernando Valley, Van Nuys, Beverly Hills, etc. from Long Beach, Orange County, Anaheim, etc. Continue north past Pico Blvd. 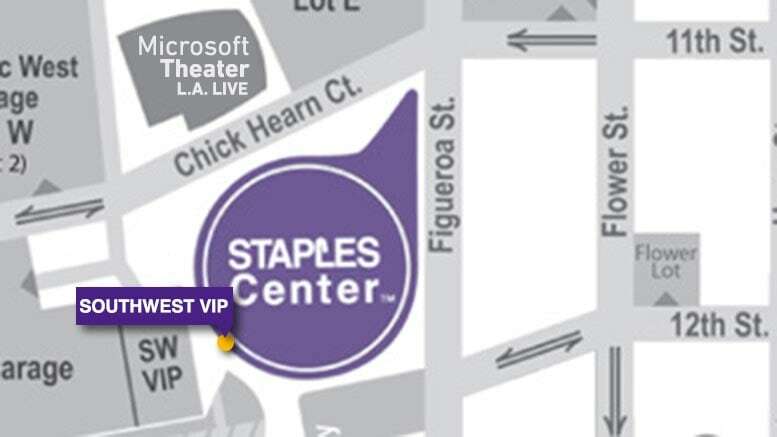 (on L.A. LIVE Way) to 11th Street/Chick Hearn Ct.
from San Fernando Valley, Hollywood, etc. exit 110 Fwy north at Adams Blvd. and turn left to Figueroa St.
at Figueroa St. turn right to Pico Blvd. turn right on LA Live Way to 11th St.
turn right on 11th St.
exit 110 Fwy north at Olympic Blvd. and turn left to 11th St.
at 11th St. turn left and continue past LA Live Way and Georgia St. 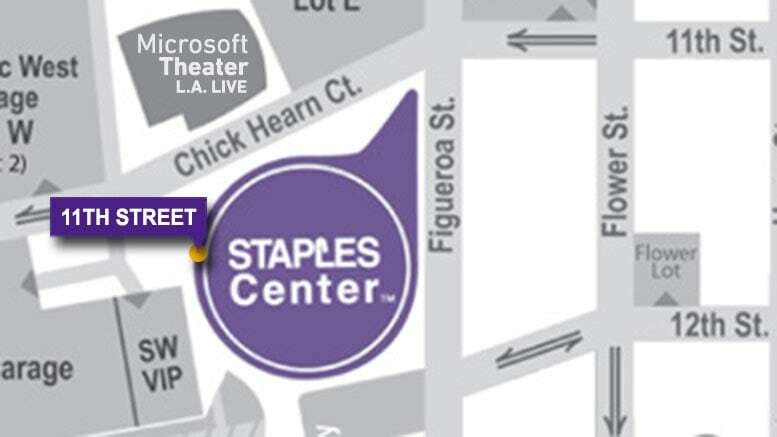 STAPLES Center will be on the right side of 11th St.
11th St./Chick Hearn Ct. entrance into STAPLES Center. Figueroa St. entrance into STAPLES Center. Star Plaza entrance into STAPLES Center. Entry for Suite and Premier Seat ticket holders. This entrance is east of the main Star Plaza entrance, closer to Figueroa St.
Southwest VIP Entry: Between 11th Street and Figueroa Entrances (next to the Los Angeles Convention Center). Entrance is for Suite and Premier ticket holders only. There are 16 electric vehicle charging stations available in the East and West Garage. Metro Bus routes service all of Los Angeles and many lines stop near L.A. LIVE including lines 30, 81, 439, 442, 460 and the Silver Line. Metro Rail transportation is also available. To find the route that's best for you, use the Metro Trip Planner at www.metro.net or contact Metro at (323) GO METRO or (323) 466-3876. Please be aware when planning your trip of the changes to the Blue Line including station closures. Learn more about Blue Line improvements. DASH Bus Route F has several stops on Figueroa St. adjacent to L.A. LIVE. For details on DASH service, go to www.ladottransit.com. Metrolink operates train service within Southern California from Los Angeles, San Bernardino, Riverside, Ventura, Orange, and North San Diego Counties. They now have special weekend passes for only $10 which includes free connections to Metro bus and rail lines that stop nearby. For train schedules and more information, please call (800) 371-5465 or visit metrolinktrains.com. AMTRAK Train service to Union Station gets you into the heart of Downtown Los Angeles, where you can transfer to Metro Rail. Go to www.amtrak.com or call (800) USA-RAIL for train schedules and information.